The 2016 Leadership series is coming to a close but we are going to go out with a bang! Our final three webinars are part of a series that will help us learn how to both lead and follow as we work with people from different generations. 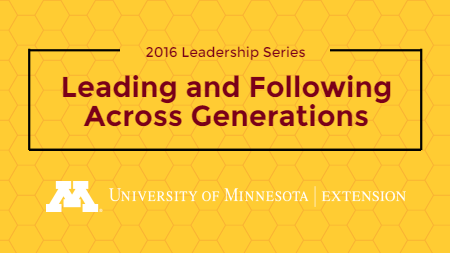 The Leading and Following Across Generations series examines ways to move beyond stereotypes and potential conflict to bridge across generations which can increase creativity, problem solving, and learning. Friday, September 9 - Lisa Hinz will start the series by exploring the unique mindset, expectations, and work styles of each generation. Friday, October 7 - Jody Horntvedt will share tips and tools for communicating and connecting across generations to create valuable collaborations that will strengthen community building efforts. Friday, November 4 - Brian Fredrickson will close the series by helping participants explore ways of harnessing the strengths of each generation to lead and follow more effectively in order to maximize the most from the attitudes and skills of each generation to strengthen our communities. Participants will receive materials to review one week prior to each session. Participants will also be guided on how to have across generational conversations that will be used in the October and November sessions. Registration is open now through September 1 at 11:00 PM (CDT) for this exciting and informative series. You will only need to register one time to participate in all three sessions. Register at http://z.umn.edu/leadgenerations.